Over the next few weeks, we will be posting information here about the meeting place and the congregation of the Chapel of the Interlude in Drake, Colorado. Scroll down to read posts, most recent first. You are welcome to leave a comment on any of the posts by clicking on the little dialogue bubble in the upper right corner of the post. Information here will be somewhat generic, given the public exposure of the internet, but members should be able to glean helpful information from these posts. If you have any questions about the people or the gathering of the Chapel, please feel free to call me at 970-seven seven six-zero98six (I have to do that so my number doesn’t get sent all around the internet) or to post a comment here. Wow! Nothing here for a long time. I apologize! We continue to meet at the BTCA building at 5:00 on Saturday evenings. Now that the summer is nearly over and the road is open again for everyone (with occasional delays), we are able to reevaluate several things about our ministry. Be watching here for any changes. We have an offer of a small property along Hwy 43, the Glenhaven Road, about three miles west of Drake. It would be a gift and about one acre right next to the road. However, working with the county to subdivide the property and get through all the land and water mitigation paperwork is a serious challenge. We were told that it could take two years and several thousand dollars and still have no guarantee of an outcome in our favor. Since that time, we have been told many different possibilities. Some limit the size of the building, some would greatly expand the necessary size of the property gift, some would involve legal maneuvering at significant cost. Added to this are the changes to our original property. There is some question as to the new size of the building lot, now that the Riverforks Road has changed. We also are concerned that the changes along the river have made our parking area much smaller. It does not appear, at this time, that we will be able to return to our original property and rebuild. We are unable to purchase the property next to ours, in spite of the fact that it has been all but abandoned by the owner. So, we are looking for options. We certainly want to remain in the Drake community. That is the definition of our ministry. We believe that community should have a church that cares and presents the love of God. We continue to minister to folks from the canyon, Storm Mountain, Estes Park, and Loveland. This process has been challenging for us. The congregation is amazingly patient and resilient. We greatly desire our own property and building and the opportunity to rebuild our service to the Lord and the community. We have been given permission by the DOT and Kiewit to continue to hold our services at the BTCA building next to the fire station in Drake. With the road closures our Loveland folks would not have been able to come up the canyon for a service at any time. Permits for travel through the work zones at certain times were given only to residents of the canyon and mountain communities near Drake. However, we have special letters allowing us to pass through for our worship services! This was the best choice of what was available to us. We invite folks in the Drake and Glen Haven area to join us for worship at that time. We understand that it will be difficult for residents to connect with their regular churches during this time, and we welcome you for as long as you wish to be with us. We are grateful to the Lord for the opportunity to remain in the Drake community while the road construction is being done. We also look forward to the day when we can rebuild and settle our ministry once again. If you wish to come up to the Chapel for Saturday service and live east of the road closures, you will have to call someone from the church to arrange a ride or loan of a permission letter. We are not allowed to make copies of the letters we have received and the letter must be available to show the officer at the roadblock. While this may seem restrictive, we feel it is generous, and we are grateful for the permission to continue to hold our services in the canyon. If you are coming from areas west of the fire station in Drake, you will not need any special permits or letters to attend a service with us. The road closure begins just east of the fire station. The photo above is what remains of the chapel building. After the fire, inspectors determined that the entire A-frame of the sanctuary would have to be rebuilt. That level of reconstruction necessitated bringing the rest of the building up to current code, particularly the current flood plain codes. When we learned that we would have to raise the entire structure 18 inches above the flood plain, which ran to about two feet high in our sanctuary, we knew that we had to demolish the entire structure and start again. We are grateful that our needs have been covered by Church Mutual, our insurance company. They have been good to work with. We still do not know what kind of building we will be able to put up and when, but we are trusting the Lord and His timing. A further complication for us is the repair of Hwy 34 from Loveland to Estes Park. Beginning in October, the road will only be open to residents and business owners, and then only for certain hours. These hours do not include a Sunday morning worship time, and many of our members are not residents of the canyon. The decisions on who will be allowed to travel the highway have not been finalized yet, so we are hoping to be able to meet in Drake on Saturday or Sunday evenings for worship. Currently, and for the foreseeable future, we meet at the BTCA building, next to the fire station in Drake. It is adequate for our needs and the folks have been easy to work with. We are grateful to continue to have a place in the community. Through all of this we are continually reminded that the Chapel is not a building. The Chapel is a family of people who worship the Lord together in Drake. We are also very aware that the Lord has protected us through the flood and through the fire. Now we are trusting Him for the future. We invite you to pray with us that the Light of Jesus will continue to shine in the Drake community through the ministry of the Chapel. God knows His plan and His timing. Pray that we will be patient to trust Him. You are also welcome to join in worship with us at the BTCA building at 10 AM on Sundays as long as we are able to meet there. When and if the situation changes, we will post new information here. For the next two Sundays (May 8th and 15th) the Chapel family will be meeting at the River Forks restaurant at 10:00 AM. The BTCA building will be used for the annual Pancake Breakfast on the 15th and set-up is the week before. We are grateful to the BTCA for allowing us to use their building while the Chapel is being rebuilt. We would appreciate your prayers as we meet with planners and builders and insurance folks over the next several weeks. We have no timeline yet for rebuilding. The Chapel survived the flood of 1976 and the flood of 2013. We worshiped there for a year and a half – then disaster struck again! The house next door had been ruined by the flood and sat waiting to be demolished ever since. But Saturday evening, March 12, it started on fire. 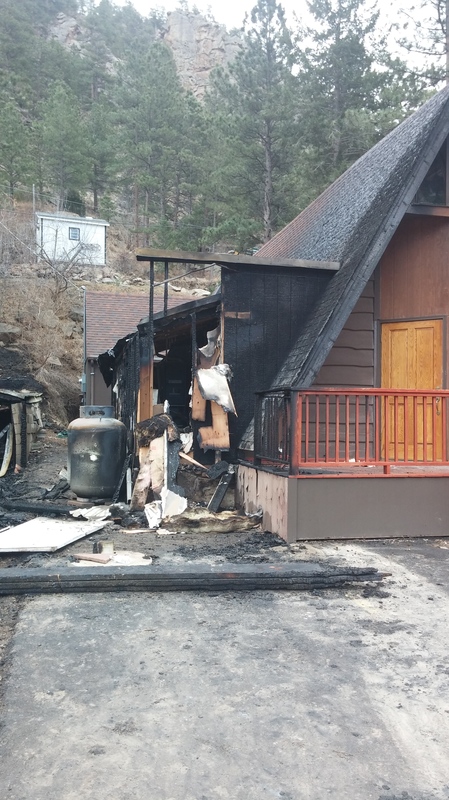 Since it was so near the church, our propane tanks released their gas (a safety feature so they wouldn’t blow) and the resulting heat burned the side of the Chapel. 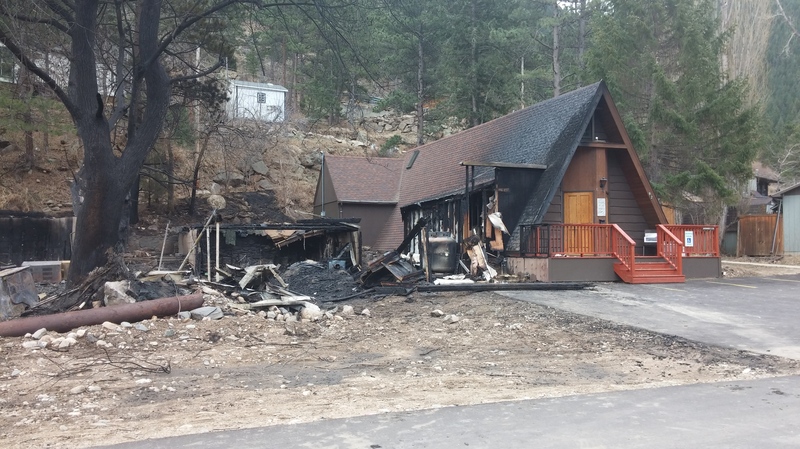 While no fire actually burned the inside of the Chapel, the extreme heat and the smoke caused major damage, particularly to the A-frame. The new paint boiled, the peak of the ceiling is blackened, and even the rafters have been damaged. Of course, everything else has been blackened and saturated by smoke. Our furnace room and storage area were destroyed. Five fire departments fought the fire, which was one of the largest the area has seen recently. We are very grateful for the diligence and hard work of those who fought the fire. We don’t know yet the full extent of the damage. Adjusters and contractors are working on that assessment. Nor do we know how or why the fire started next door. That is something the sheriff’s department will determine. What we do know is that we will not be using the building for at least a few months. We are covered by insurance, and they are already working on our behalf. We are meeting at the BTCA community building next to the Drake fire station, a mile or so east of the Chapel. Our hearts are hurting, but spirits are lifted by being together. No one was hurt, and we are grateful. I apologize for not thinking of updating here sooner, but will try to keep this site up to date again. I believe every part of the Bible is part of the message of God’s love in Jesus. Sometimes that’s not easy to see, and most of us have not been taught to see Jesus outside of the four gospels. Over the next several months, our congregation will be looking at each book of the Bible to see how it fits into God’s plan and shares His message of love. So watch for the links to these messages. They will be in mp3 format and you can listen to them on your computer or download them to your mp3 player. You should be able to right-click on the link and then click “Save target as” or “Save as.” Just tell it where you want the file saved. Then go through your normal download process to put the message on your player. Again, if you don’t want to do all of this, just click the little player to listen on your computer. Tomorrow will be two years since the flood of 2013. A lot has changed. We are back in the Chapel building, but couldn’t worship last week because the road was being replaced in front of the church. We miss the simple quiet of the community. As things continue to change, nerves are a little on edge and no one knows when the changes will happen. 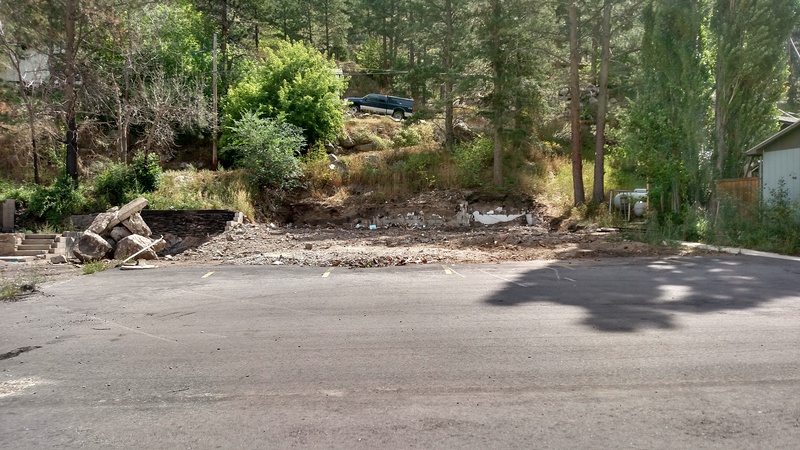 The Glen Haven road is under repair, but challenging for anyone who wants to travel it. The Storm Mountain road is being repaired and the bridge will be replaced. Even 34 will be replaced in the near future, according to the news. All of these affect our people. We have lost a couple of stalwarts since my last post, Cliff and Norm. Both of them were very much a part of the Chapel family and we will miss them. As fall sets in, we lose some of our summer folk. We wish them the best in their travels. But we are back! The Chapel family is together, and we continue to move forward. God has greatly blessed us over the past two years, and we trust that He will continue to bless in the future. There are still changes to be made, things to do. The parking lot and landscaping was put on hold until the road was finished. We still have some issues inside, but those are winding down. We are very happy to be back in the building and ministering in the community again. Our goal is simply to tell whoever will hear the good news of God’s love in Jesus. If you live up here, or if you come to visit, please stop in some Sunday morning. Our worship is at 10:00. We would love to have you with us!